When major holidays roll around, you probably get caught up in all the excitement of planning parties, vacations, and spending time with friends and family. While that’s certainly fun, at the same time, you could miss out on a huge opportunity—marketing your business. No matter what type of business you own, the summertime allows you to both reach out to your current audience AND bring in new leads. This doesn’t mean that you have to put your holiday plans on hold. You can still have that fun and help your business simultaneously, without worrying too much about time or expense. Promotional products will make this a reality. By incorporating them into your marketing strategy, they can seriously help you utilize holidays to your advantage (and help you celebrate in style)! Holidays are all about making connections, whether it’s with friends, loved ones, or even your own customers. Reconnecting with customers whom you haven’t heard from in a while reinforces your interest in being known. Extending your warm wishes to customers by providing them with complimentary promotional gifts serves as a means of expressing gratitude for their support, and as a gentle reminder of your brand. But don’t just customize just any swag – in order to actually make a connection with customers, give them items that they’ll actually appreciate. That way, customers will automatically have a positive association with your brand. We’re all naturally inclined to connect with brands that have personality, and promo products are perfect ways for you to show YOUR brand personality. For example, in honor of Independence Day, why not give the Window Box of 12 Corporate Oreo® Picture Cookies? Delicious, hand-dipped cookies with your logo on each one, proudly made in the USA will definitely add fireworks to your brand strategy! While you are busily trying to make yourself the star of the holiday, so is your competition, but you can set yourself apart with some creativity. In order to do so, however, you have to remember how essential it is to humanize your brand and make it more personal than just any annoying ad. Custom gifts show customers that there are real people behind your brand, not just a business entity, and that you have a unique and meaningful message to share. Customers get tired of seeing the same sort of campaigns over and over, and it has become increasingly challenging to capture their attention. Thus, a promotional swag lets a customer easily interact with your brand on his or her own terms without feeling pressured into a purchase. This time of year, customers are preparing for cookouts, and firing up their grills. Your business can equip them with all the tools they need to be the Grill Master with this set that can be custom branded with your corporate logo. During the holidays, a custom promotional gift can wrap your marketing up in a bow – literally. Cohesive messaging is absolutely necessary for your marketing efforts to be successful, and in order for customers to clearly understand who you are, every piece of marketing and advertising that you put out should have the same look and feel. Custom gifts can be the final means of communicating and reinforcing your brand message to customers. It acts as a call-to-action, encouraging customers to further communicate with your business. You could satisfy their sweet tooth and get the energy going at the next holiday party with this delicious cookie or brownie gift basket, complete with a branded ribbon. 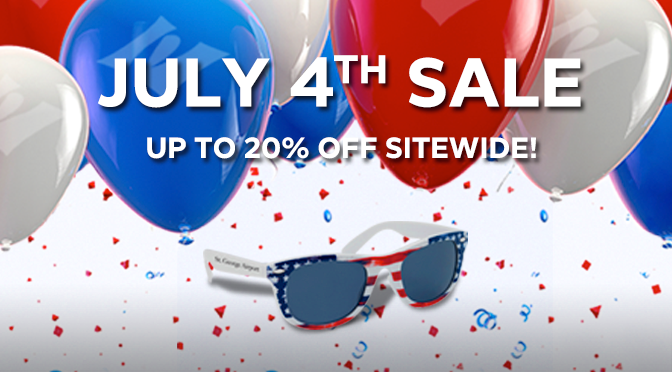 This Independence Day, and for every holiday moving forward, remember the marketing opportunities that abound, especially when you have promotional products and custom swag on your side. That way, you can have fun and still help your business flourish creatively and most importantly, memorably. Happy Fourth of July!